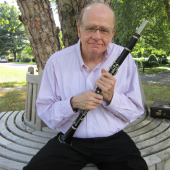 Principal Clarinetist of The Boston Philharmonic from 1992 through 2015, Mr. Hill was also founding clarinetist of the acclaimed Boston Chamber Music Society and a member of that ensemble from 1983 until 2010. He has appeared on innumerable concert and festival series, and has been widely engaged as soloist and ensemble performer under a variety of auspices since the beginning of his career in New York and Los Angeles. Mr. Hill has also served as principal clarinetist of The New Haven Symphony, The Long Beach Symphony, The Handel and Haydn Society Orchestra of Boston, The Mainly Mozart Festival Orchestra, The San Diego Symphony, and The Cascade Festival Orchestra in Oregon. He has appeared with both The Boston Symphony and The Boston Pops. He holds both a Bachelor’s and Master’s Degree with Honors from The New England Conservatory. He also attended The Cleveland Institute of Music where he was a member of the class of Robert Marcellus.